IFA 2011: Sony launches two new tablets to challenge Apple | What Hi-Fi? At its press conference today at IFA in Berlin, Sony effectively declared war on Apple's dominance of the touchscreen tablet market. Samsung's Galaxy range is currently hindered by Apple's various attempts to sue it for patent infringement, so Sony's entrance into the fray was a noisy one, with CEO Sir Howard Stringer declaring Sony's intention to "take the tablet world to another level". He also declared: "It's not who makes it first, it's who makes it better." The company is launching two models, the Tablet S (top left) and the Tablet P (top right). The Tablet S is a roughly iPad-sized device, with a neat curved-around design that makes it feel more like a book in the hand, and also gives you a better viewing angle if you simply lay it down on the table in front of you. 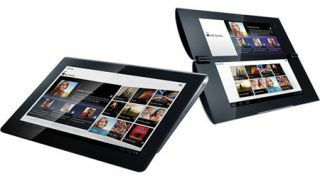 The Tablet P (above), on the other hand, is the world's first clamshell tablet with a foldable, dual-screen design where the two 5.5in screens can be used either separately for multi-tasking, or together to form a single, whole screen. Both tablets make extensive use of Sony's increased evolution of its content services: gone is the slightly odd Qriocity name, replaced with the simpler Music Unlimited and Video Unlimited. They're PlayStation certified too. Other tablet highlights include a very neat and easy-to-use way of making your Sony tablet into a universal remote for any kit you have in the house; using it as a gestural remote if you wish; and perhaps best of all, the ability to throw with a slide of your finger on the screen any content you are enjoying to any other device you own that's on the same broadband network. We've seen this in action, and the word cool doesn't quite do it justice. The Tablet S (side profile above) will be available from the end of September. UK pricing isnt quite fixed yet but a broad European price of around 479 Euros for the Tablet S seems likely, with the Tablet P coming out in November, and likely costing 599 Euros.